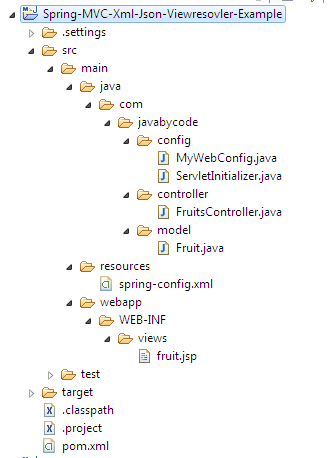 This tutorial introduces Spring MVC Content Negotiation Viewresolver XML JSON Example. Spring MVC Content Negotiation features help you response different types of a document at the same URI. The best appropriate response will be served to fit your request. In this tutorial, we will create the example that negotiate between XML and JSON using HTTP Accept header or file extension. Here, we need to create the content negotiation manager by extending the WebMvcConfigurerAdapter and override two methods configureContentNegotiation and configureViewResolvers. The configureContentNegotiation(ContentNegotiationConfigurer configurer) method is used to register a default content type. The configureViewResolvers(ViewResolverRegistry registry) method is used to register different view resolvers that the application can serve. In this code snippet we register both the MappingJackson2XmlView for serving XML and the MappingJackson2JsonView for serving JSON. This Fruit POJO is used to add content to the XML and JSON response. The FruitsController is responsible to create and return an instance of the Fruit class for Model which be used to display in XML or JSON format. Building project with maven then deploy file war on application server or servlet container (Tomcat 8 for example). To view JSON response we need to pass a HTTP “Accept: application/json” header with request. Here we put the URL http://localhost:8080/xml-json-viewresolver/viewfruit/1 in the form DHC plugin on Chrome to pass HTTP “Accept: application/json” header via request. The json content should be such as the below screen shot.